This dramatic infrared image shows the nearby star formation region Monoceros R2, located some 2700 light-years away in the constellation of Monoceros (the Unicorn). This dramatic infrared space wallpaper shows the nearby star formation region Monoceros R2, located some 2700 light-years away in the constellation of Monoceros (the Unicorn). The picture was created from exposures in the near infrared bands Y, J and Ks taken by the VISTA survey telescope at ESO’s Paranal Observatory. 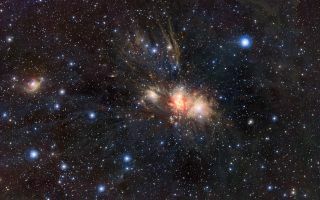 Monoceros R2 is an association of massive hot young stars illuminating a beautiful collection of reflection nebulae, embedded in a large molecular cloud.